Featuring a popularity unmatched by almost anything in the past few years, Frozen boasts a legion of followers and plenty of collectibles. 2015 Funko Pop Frozen Fever vinyl figures celebrate the short film sequel Frozen Fever with two new options for sisters Elsa and Anna. At just seven minutes in length, the short includes most of the main cast members returning to their familiar Frozen roles. The main plot of the release centers around the plans for Anna's birthday and the problems that arise. The short film was originally released in theaters alongside the full-length Cinderella live action movie on March 13, 2015. It is included on several Blu-Ray releases, including Walt Disney Animation Studios Short Films Collection and Cinderella. 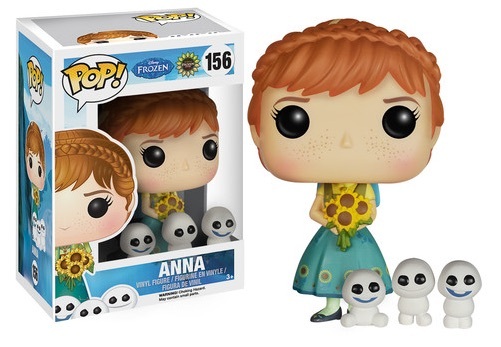 Clad in summer clothing, the 2015 Funko Pop Frozen Fever figures each come with three small snowmen, also known as Snowgies. Without ruining the story, the miniature snowmen included with the figures make their debut in Frozen Fever. 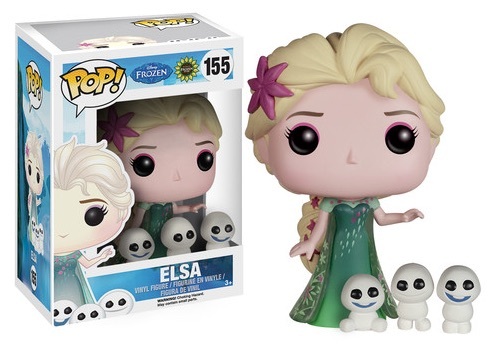 The Frozen Fever Pop! figures for Elsa and Anna are numbered as part of the Pop! Disney line and measure approximately 3 3/4" tall. Fans and collectors can officially add the figures to their collection when they release in September of 2015. A larger set dedicated to the original Frozen film can be seen here.